From left, Deb Goldstein talks to Common Council Planning Committee members Faye Bowman (D-District B), Shannon O’Toole Giandurco (R-District D), Tom Livingston (D-District E), Bruce Kimmel (D-At Large) and Committee Chairman John Kydes (D-District C), Tuesday in City Hall. 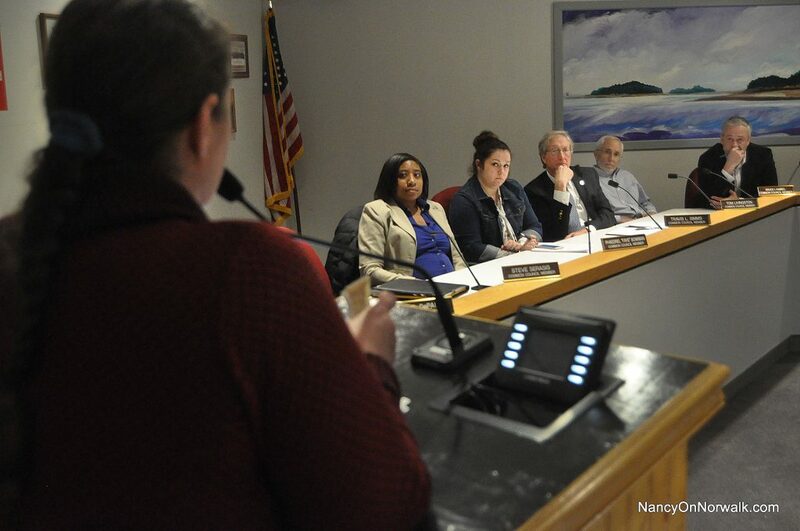 NORWALK, Conn. — The debate continued Tuesday, with three GGP supporters giving one point of view to the Common Council, and a persistent critic offering rebuttals. “It’s boggles my mind that we have to have more of these meetings,” mall supporter Wini Mola said, at the first public hearing on GGP’s request to modify the existing agreements yet again to allow the company to proceed with building The SoNo Collection as just a mall, no mixed-use component included. The meeting ended with just a little bit of forward movement, a promise of more documentation into the value of GGP’s project. GGP will be paying Norwalk $8 million by the end of the year if construction proceeds, GGP attorney Larry Cafero said, announcing that he “bristles” at the suggestion that GGP has been dishonest. GGP spent 100s of thousands of dollars to develop plans for the hotel, Cafero said. GGP has paid the city the $1,022,500 it was obligated to pay for the easement over North Water Street, Cafero said. It will pay $348,000 on Wednesday for a foundation permit, he said. “There is no doubt in our minds that Nordstrom and Bloomingdale’s will be the anchors of the mall now and for years to come,” Cafero said, defending the request to change the definition of Class A anchor. It would be a huge mistake not to move ahead with the mall, former Common Council member Patsy Brescia said, while Mola said Connecticut lost GE because it wasn’t willing to negotiate. The SoNo Collection will bring jobs and raise property values, in addition to bringing in tax revenue, she said. “We are in dire need in Connecticut. We need something like this. This will bring a vibrancy back to our community,” Mola said. Goldstein used words uttered by CEO Sandeep Mathrani in a recent conference call as part of her argument. Mathrani said GGP is going to get $700 a square foot in retail sales but the city’s Land Disposition Agreement (LDA) is holding them to $425 a square foot, Goldstein said, advocating for the city to hold out for more money. Goldstein said that she’d been informed by GGP Vice President Doug Adams told her that there is no economic impact to the project from the removal of the hotel. “How can the project be just as valuable before and after the removal of the hotel and yet somehow the economic value of the hotel itself is so important that it has to come out? If it was in and it was value and it was out and it’s equally valuable how is that profitability metric being worked out? You should be asking those questions,” she said. Council member Shannon O’Toole Giandurco (R-District D) went on to ask if there are valuations of The SoNo Collection, with and without the hotel, as mentioned in the last meeting on this topic. The Tax Assessor’s office does not have a valuation, Attorney Eric Bernheim, who has been hired just to represent Norwalk with this project, said. GGP has an analysis and while it’s normal to be skeptical, perhaps Norwalk tax assessors could review it and see if there are any obvious mistakes, Council member Tom Livingston (D-District E) said. Coppola said he’d ask Assistant Tax Assessor William O’Brien, who is “very capable on valuation side,” to review it by May 15. It’s a good thing to open the door for more ‘non-retail commercial activity’. Competition happens unless, of course, there’s no growth as most of the rest of Connecticut is experiencing. Finish this up. Get some shovels in the ground and build the mall. Re the picture caption. Bruce Kimmel is not a member of the Planning Committee of the CC. I believe his interestis as Chair of the Finance/Claims Committee of the CC. Travis Simms, who is a member of the PC of CC, also attended last night but is not in picture. Also not in pic, and not a member of PC of CC, in attendance was Councilman Bonenfant. Regarding competition. If you were the owner of a theatre or a fitness center who has been paying full freight on your property taxes as a member of this community for years, you might have a problem with thousands of square feet of non-retail suddenly going in in an area where it is not supposed to be, according to all of the city’s planning for the area. That wouldn’t be in your business plan. Oh, and not only would you be subject to that hit, but the city would be subsidizing your competition while you continued to pay full freight on your property taxes. This is the reason a city does planning. If we can’t be bothered to do it right, then we are never going to be able to get our taxes and our services back in balance. GGP will do what is best for itself and its investors. Only our elected and appointed officials can do what is right for the City. Some things are too valuable to deal away. Why is “Probably impossible ” or “Hard to do” an acceptable answer for not doing something? Only City employees can say that and get away with it. Fire them! Hire negotiators. It is possible to support the development of this property by GGP and still advocate for the best possible deal for Norwalk–a deal that would include direct improvements to the community rather than kickbacks. GGP will already have workers and equipment on site. Therefore the cost to construct community assets would be less for GGP than it would be for the City. Norwalk seems to be losing the mixed use requirement for development of this parcel. Our reps negotiating this deal have an obligation to us to hammer out the best possible development for the city and those who live here. A mall that offers nothing to locals, that is driver rather than pedestrian friendly and that canibalizes local and small businesses will not improve the city of Norwalk. An assessor is really not qualified to put together a valuation on a complex property like this. They rely on outside experts to provide valuations for these complex property types. Property taxes are based on Market Value, not cost to build. Case in point – the cost to build the mall with the hotel could be more expensive than the market value of the mall with the hotel. In fact, the hotel could actually detract from market value. But we don’t know that since we are not modeling this project with a real time valuation model. To provide a market value for this property, at virtually any stage of the process is A) not costly, nor hard, B) can be done fairly quickly, and C)can be updated concurrently to reflect any change in investment parameters. But like everything else, you need to engage the right professional with the requisite experience to do this correctly. But what has been screaming out to us across the decades is “Our process is broken”. It’s brought us POKO, almost lost us Head of the Harbor after delaying it for over a decade, has left downtown (Wall Street) blighted for three + decades, will costs us considerably more for Library Parking, imposed a business killing predatory parking system on our urban core, lands us in the national news over the Mosque, chases away small developers, entrepreneurs and business owners on a regular basis, lost two qualified developers for the 95/7 site – Fred F. French and Spinnaker on the GGP site, now we might lose GGP as well. I don’t blame the elected officials or most or the staff people as, in truth, they are really not qualified with what I outlined above. But they are smart enough to recognize a problem when it’s shared with them. I think enough of us out here are making the case. I hope “changing the process” is front and center in all our future elections. I have no idea if we are getting a good or bad deal with GGP. What I do know is that our convoluted City Charter and ordinances are full of appointed boards and commissions, agencies and politicians that are overly distributed, resulting in a decision making and approval process that has resulted in NOBODY actually being in charge of the planning and zoning (AKA the Grand List) of the City of Norwalk. Sadly, the POCD Master Plan isn’t worth the paper it’s printed on. The end results are high paid lawyers out maneuvering the city, resulting in payouts for bad land use, hodge podge developments, or unnecessary tax credits, at the expense of residential property owners. Residential property taxes fund 85% of the salaries at City Hall and despite all the development, continue to rise. Who is in charge of making all this development work for the economic benefit of Norwalk taxpayers …NOBODY! Only thing more pathetic than the LDA and URP amendments was how many folks (3) showed up to speak at the Public Hearing. Though I do think this is the first time that pro-mall folks actually outnumbered the skeptics. At this point what is the likelihood that the redevelopment agency and the City could/would renegotiate this deal regardless of public input at meetings? The wrong people have been charged with making decisions on behalf of everyone else. The charter needs to be revised so some of these appointed positions become elected positions. The town needs to add language to the charter to make the plan of development a binding document instead of just a suggestion. No development decision should be made that is not in concert with the town plan. Board members and commissioners who fail to follow the plan should get booted off. This is fifth grade civics that Norwalk is failing at. And yes that was a dangling participle. Correction. I ended a sentence with a preposition not a dangling participle. When the deal is bad, the grammar often follows. What is Norwalk’s post-retail strategy? The painful saga for the retail industry continued yesterday as three major chains posted disappointed earnings (again). It’s clear the growing trend of consumers making the switch to online shopping is taking its toll. Macy’s (-17.01%) stock hit a nearly six-year low after the department store reported a hefty 38% drop in quarterly profit and 4.6% fall in quarterly same-store sales. Reminder––in late 2016, Macy’s announced plans to close 100 stores. Might be more where that came from. Nordstrom (-3.92% after hours) also posted a miss after the bell, as a growing e-commerce business (10.9% increase in sales) couldn’t hold off brick-and-mortar from forcing same store sales 0.8% lower.